WOW! 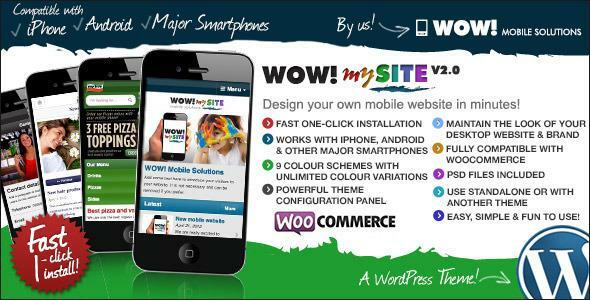 mySite is a WordPress theme optimised for mobile devices. With WOW! mySite you design your own mobile website with nine customisable preset colour schemes, powerful theme configuration options and multiple page templates. Add your own high resolution logo, custom fonts and shortcodes and fine tune with WOW! mySite’s unlimited colour options whilst maintaining the style and branding of your desktop website. It is suitable for both corporate and personal use and for non-technical users with very limited WordPress experience and for programmers with technical know-how. WOW! mySite is also fully compatible with WooCommerce enabling you to sell your products online. WOW! mySite is easy, simple and fun to use… The only limitation is your imagination! WOW! mySite is fully compatible with WooCommerce, so if you already have a desktop website selling products you can now use WOW! mySite to sell your products via mobile devices! It’s simple to set up too with easy to follow instructions. Share the post "WOW! mySite WordPress Mobile Theme"